I have 2 devices using Evernote, Mac OS and iOS. 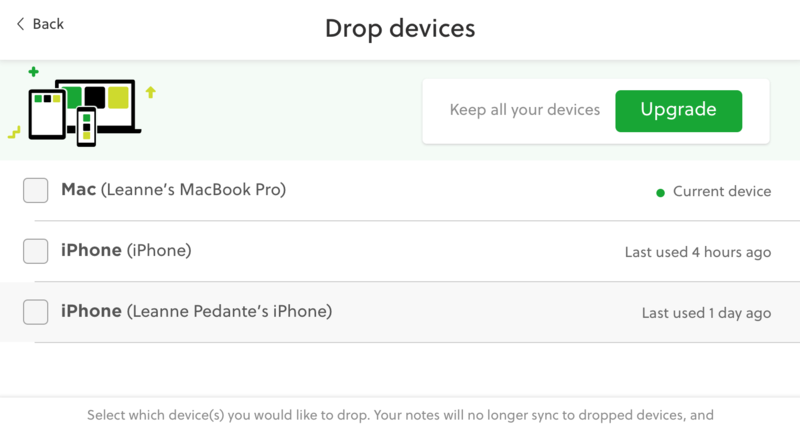 Recently whenever I sign in to Evernote on iOS it tells me I have 3 devices and I need to deactivate one of them. My iOS device is listed twice. So I deactivate one of them and in a few hours I have to do the same again. I have the same problem. I have one iPhone and one iPad that I use with Evernote. 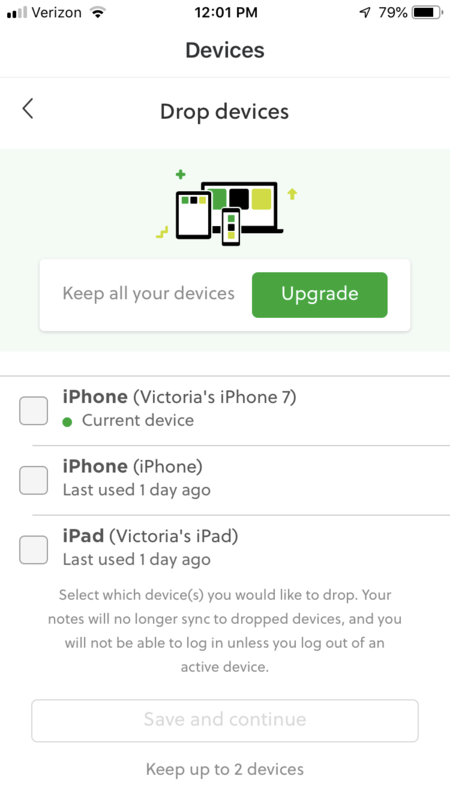 Today, Evernote is identifying my iPhone as a different iPhone than I used yesterday and it is asking me to unsync one of them. It’s only one and the same phone. Yes, that's the same picture I see. One phone is called my iPhone the other is just called iPhone. Is this some kind of ploy to get us upgraded? For those of you that are having this issue did you recently update to iOS 12? I have run into a verification issue on other sites and I think that's what caused it. @Scott T. could this be the culprit here? @Sayre Ambrosio It's too early for us to determine a cause. It's actively being looked into, but I'm guessing it's not related to iOS 12. I think it goes beyond just a client-specific issue. Good to know. Thanks. So if this comes up on Directly, I can let them know it's being actively investigated. Should I point them to this thread to keep an eye on it or there a better one? Point them here... my thread's the best! @Sayre Ambrosio Sure. I'll try to keep the thread updated on status. Thank you for investigating. I look forward to having the issue resolved. @Sayre Ambrosio @CreationMom, I believe this should have been fixed in production a few days ago. Are you able to verify if you are still encountering the issue? Thanks! I am still having the same issue. It’s still showing me with two iPhones. I have not had it for about a week. I will notify this forum if I do again. @CreationMom Thanks for letting me know. I've reached out to the developer regarding your account. I will give an update when I hear back. It's possible this is a separate issue. I have a free account and just tried to open Evernote on my iPhone and it told me I have to "Upgrade to continue using Evernote on this device." Then I went to my Windows machine and launched it, but got the same message. The alternative presented is "Stay with our current plan. Unsyc devices." What is going on? Do I have to start paying? I only us it on my iPhone and my laptop, and I don't use it that much - mostly to keep track of Christmas present lists and an occasional to-do list. I haven't seen any issues with this particular thing recently over on Directly. I have however just come across one that mentioned that in trying to revoke a device they have an iPhone listed and they don't own an iPhone. Thank you @Sayre I am not getting those messages anymore, so it appears to be fixed. I have a same issue here. I have a windows 7 desktop and a android phone galaxy 7 and evernote keep says I am using iphone. But I don't have a iphone. It just appeared on my android screen today again. I agree checking my account information as well. Basically, we have a database query that pulls what unique devices you are using for Evernote. When there was daylight savings at the beginning of November, due to the fact that we move the clocks backward, we had a weird scenario where it was counting the same device as two different devices if it had activity during the repeat hour. We fixed our query, so anybody who had the problem should automatically be fixed. If anybody is still having problems, it should not be related to the issue we fixed. @CreationMom, you should probably delete out the duplicated devices and you should be fine. After that, if it happens again, please let our customer support know and our tech support can dig into this further. @SeanJ, If you are seeing a device that isn't yours, it's possible you had somebody else access your account. I would revoke access for the device and change your password to be safe. Wow... daylight saving, what a crazy idea with some wild implication. That's fascinating - thanks for the info and the effort to fix the problem! All seems to be working fine for me. I have had the same issue with two iphones showing up for quite some time now. It just happened again this morning, so I'm not sure the daylight savings fix helped. I just reinstated my Scannable and Evernote accounts after a long period of time for Evernote and I'm being told that I'm using three devices when I've already unsynced my iPad. If you ever see devices listed on your account that you do not recognize, you should revoke access to these devices in your settings and change your password. Please review our security tips for more details on keeping you account safe and preventing unauthorized access. @freelee Unless you change your password after revoking the device, it will show up again if your account has been compromised. As noted above, please review our security tips for additional help with securing your account. Having same issue. Still not fixed with updating the app.. I lead the security team at Evernote. The Evernote service and our apps are still secure; however, we discovered an unauthorized person testing a list of usernames and passwords that they stole from a site not associated with Evernote. If this person had the correct password for your account, they connected an iPhone app to it; and then used that app to search for cryptocurrency credentials. This isn’t a bug in our apps or service, it’s an unauthorized user connecting to your account. You need to take some actions to protect access to your account. Change your password to a unique one. Make it one that isn’t easy to guess. Make it one that you don’t use on another web site. Consider using a password manager to keep track of your passwords. Install an anti-malware application on your computer and run it periodically to clean up any known malware. Setup two-factor authentication on your account, especially if you don’t want to use a unique password on your Evernote account. Then, even if someone learns your password, they won’t be able to access your account without also stealing your phone. @Rich Tener: Thanks for the update. This seems worthy of a community announcement here in the forums, at least. And maybe a blog post. @jefito thank you for the suggestion; we will post more about this type of issue and how it relates to password reuse in broader forum. I wish I could say that this was a one-time event. We detect and respond to multiple groups of people testing stolen credential lists against our service. It's also not unique to us. It's constant activity hitting every major web service. For anyone that would like to see if they are affected by a public breach and have had their password stolen, check out https://haveibeenpwned.com/ It's not an exhaustive list, but shows the importance of using a unique password on every web site you use or setting up 2FA. @Rich Tener Actually, now that I think of it, and particularly since it's ongoing, it might be a good candidate for a post in the new FAQ section that Shane set up. Gives us non employees someplace to point to, for affected users to get a start on figuring out what's going on and how to proceed (like some of the advice given above). Beyond that, I and I'm sure others here appreciate your responsiveness in the forums (and presumably behind the scenes). I am still having this problem. Two iPhones are listed plus one desktop. I don't own two iPhones. Every so often Evernote asks me to deactivate a device, which I do. I just had it happen again after a few months of it seeming to have been fixed... About a week ago I updated my iOS. So that may have something to do with it. Just happened again to me. This is super annoying to have to constantly activate/deativate an iPhone when it is clearly the same device. @Grzamy To clarify your comment, you're saying that the device in your list is definitely your own device and just a duplicate? You're saying it's not potentially an unauthorized device? Evernote will show me all my devices, two iPhones are listed plus one desktop. It tells me “last sign in” on each phone and both phones have the same name. I sign in on my phone frequently so I have no reason to believe it’s an unauthorized device. Thanks @Grzamy. I'll send this over to our dev and support and see if they have some information on this that can help. I started having this problem 2 days ago. I have one Mac Ver 10.14.2 and only one iPhone but Evernote keeps saying am using two iPhones and gives them different names. Very annoying! It happened again yesterday! Surely there is a fix for this. @Idahobob, I looked at your account. The recent iPhone devices that have shown up in your account (and you have revoked) are different device identifiers than your currently active iPhone client. This looks like the issue Rich identified in his post above. Please ensure your account is secured. I would advise changing your password and not sharing it with any other website login. You may also consider enabling 2FA for your account. Thank you Scott. I will change my Evernote password and see how that works. I'd rather not go to 2FA. It happened again to me today. It happens when I'm running Evernote on my iMac. Suddenly it locks up and tells me I need to upgrade or revoke. This time, however, instead of listing two iPhones, it listed one iPhone and an Android. I don't own an Android device. So, I revoked the Android, signed out of my iMac app and iphone app, created a new password and signed back in. So is Evernote staff believing this is happening from insecure accounts? That theory is users specify the same password on various sites. The bad guys pick up the userid/passwords from a less secure web site, and try them out on sites like Evernote. The protection for this is to only use your Evernote password at Evernote. They're testing lists of emails/usernames to see if they are valid Evernote accounts. Presumably these are coming from previous leaks/hacks. If they determine it's a valid account, they test out passwords they have based on the leaked data. We have various tools in effect to help protect our users, such as limiting the amount of failed attempts allowed by a user, IP, etc. But, the hackers are smart and can work-around some of these, such as using botnets or limiting their throughput to stay underneath our limits. As has been mentioned, the number one thing users can do is change their password and not share passwords with any other account or reuse passwords that have been potentially leaked/compromised. A good website to visit is https://haveibeenpwned.com/. You can check if your email was part of any published leak data sets. I can pretty much guarantee if you have a yahoo.com account, information was leaked. Is there really no timeout feature for people trying to brute-force usernames and passwords that they bought for $50 on the black market? Is this real life? @Tidal1234 As I noted, we have numerous rate limiters in place (which will present a captcha or even just block) and we added another one just last week based on the behavior we're seeing. But, we can't go too far with counter-measures without the potential for blocking legitimate users. So it's a balance. Let the PW-manager pick a completely random PW, 15+ digits, mixed lower/upper case, numbers and symbols. Apply it to your account. Save it in the PW-manager. Delete those stupid, easy to break „security“ questions („What brand was your 1st car ?“ - What do you think how many tries you will need to get into the account by plainly guessing on this foolish stuff ?). ... and stop blaming the service that was broken into, because most likely the security data was stolen elsewhere. If your credentials (user name, account name etc.) are tested positive by the website mentioned above, some of your passwords are in circulation for sure. This is most likely not your fault, but not changing your PW NOW is nothing to blame on others. Even if not, you can never know.